Police chiefs from around Minnesota heard a case against the legalization of marijuana Tuesday from a former White House drug policy adviser. 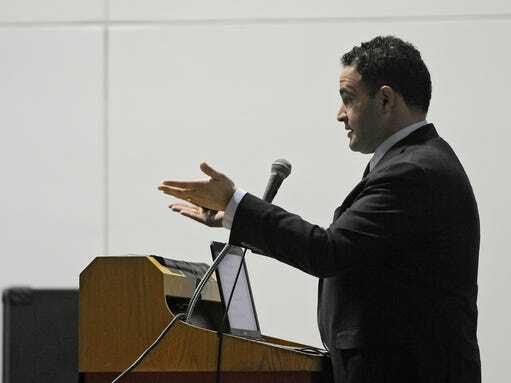 As the summer opening of the state’s medical marijuana program approaches, Kevin Sabet, a former senior adviser at the Office of National Drug Control Policy, spoke at the annual Police Chiefs’ Conference in St. Cloud about the dangers of making the drug’s use legal. Sabet praised the lobbying efforts of law enforcement officials that resulted in a restrictive law that prohibits the smoking of marijuana — allowing medicinal use only in the form of pills, oil or liquid — and allowing prescription for fewer than 10 conditions. Sabet is the president of Smart Approach to Marijuana, an organization dedicated to preventing the formation of a “big marijuana” industry. His speech portrayed the legalization movement as one driven by people seeking to create a new addiction-based industry, similar to the rise of “big tobacco” decades ago. Sabet said while common conception is that “hippies on college campuses” are driving the movement, wealthy lobbyists who will “target the young and vulnerable for profit” are behind it. And while Sabet admitted non-smoke forms of marijuana can have medical benefit, he said the push for legal medical use is too often acting as cover for recreational use. The vast majority of approved medical users in Colorado, Oregon and Montana report chronic pain to receive approval, Sabet said, and their average age is 32. While public acceptance of marijuana use increases, Sabet said he is concerned some police officers will feel pressure to go along with strong public sentiment. He hopes to encourage them not to.